Pizza Rules! is a weblog dedicated to pizza by Nick Sherman, a designer, skateboarder, and musician residing in Brooklyn. There were several reasons why I finally decided it would be worth maintaining a separate pizza-specific account. 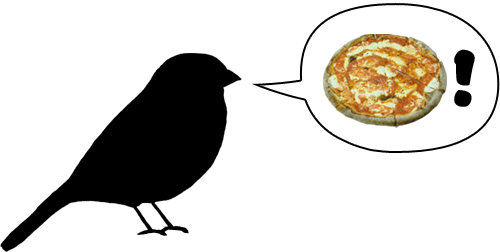 First of all, I wanted to display my pizza-related tweets in the sidebar of this site, and having a separate account was the easiest way to do that. Secondly, most of the activity on my personal account (@NickSherman) is related to typography / fonts, so I always felt bad for my pizza friends who had to endure all the type nerd content if they wanted to follow me on Twitter. Similarly, I found myself sometimes refraining from sharing pizza-related info, to spare my type nerd followers from an overload. Finally, I started a new pizza-related project this month (more on that later) and I figured it might be helpful to have a pizza-only account to supplement it. My plan now is to keep my pizza-related tweets on the @Pizza_Rules account and cross-post to my personal account when it’s appropriate. The old and new designs of Pizza Rules! shown side by side. I launched Pizza Rules! more than 2 years ago with what I was planning to be short-term design and technology solutions. After not too long, the blogging system I built the site on (MovableType) started to break and become tedious, especially because it was being hosted on a less-than-ideal server. If that weren’t bad enough, the commenting system was a pain to deal with and discouraged any easy dialogue. As such, my posts became less frequent and carelessly composed. As is the case with many personal labor-of-love projects (i.e. non-paying), the site took a back seat to other issues in my life. Now, partially inspired by this year’s Pizza Month challenge, it brings me great pleasure to announce that I’ve totally revamped the site with a new blogging system (WordPress), a better hosting service, and a newly updated design! The site now offers new functionality which I never got around to implementing in the first version, and should be generally easier to browse. 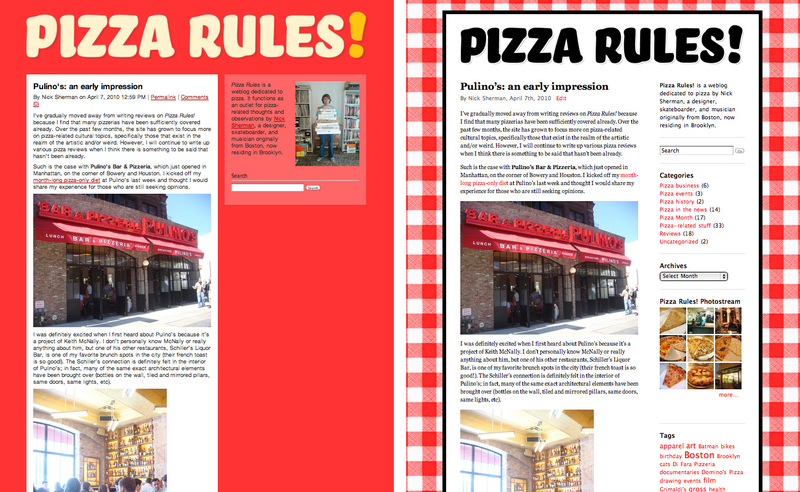 Internet pizza dorks may get a familiar tingle from the new red and white checkered background here on Pizza Rules! … it serves as a nod to an old design for Slice – “America’s favorite pizza weblog” (I would argue the world’s favorite) – which has since been rebranded, sans-checkers. With kind encouragement from Slice ‘s frontman, Adam Kuban, I’ve carried on the tablecloth theme here with my own cruder, brighter, and more literal take on the concept. As with any relaunch, there are bound to be a few bugs kicking around, and I’ll likely continue to tweak design elements on a continuing basis. If you see anything that seems broken, please drop me a note in the comments or at nick@nicksherman.com. Also feel free to let me know about any site features you’d like to see added in the future, or design tweaks you think might improve the experience. Here’s to another 2 years! 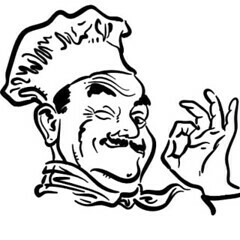 Coinciding with the beginning of Pizza Month 2010, I’ve launched the Pizza Chef Caricature group photo pool on Flickr, dedicated to stereotypical portrayals of pizza-makers (or “pizzaioli”) typically seen on local pizzeria menus, signage, and take-out boxes. I discovered by pure chance that yesterday was the two-year anniversary of the current incarnation of Pizza Rules! This reminds me about the task I’ve been meaning to address for so long of updating the site to be more easily browsable; which, in turn, reminds me how much I regret setting up the back-end of this site the way I did.